Baby Bricks are designed to be a caricature of a Bricklin and are the most affordable model Bricklin option you can find! 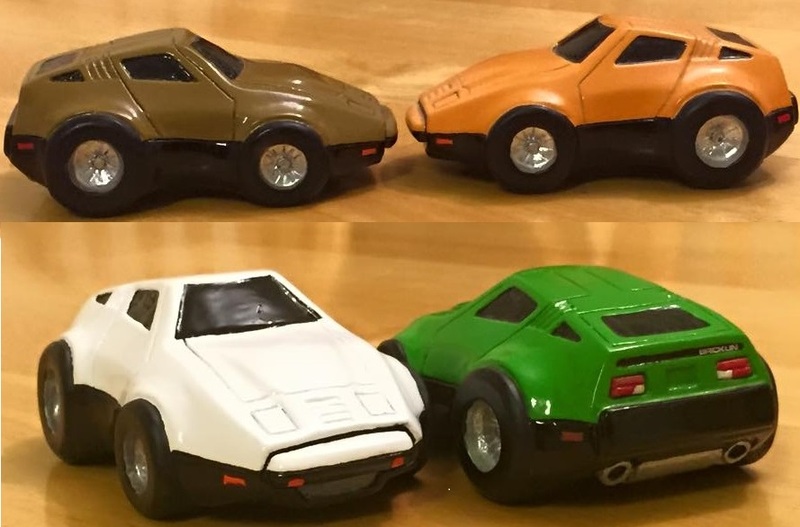 THE 2ND SERIES MODEL BRICKLIN LINE IS RETIRED. THE LAST OF THESE MODELS IS SOLD AND IS CURRENTLY ON THE ASSEMBLY LINE. To the left, you'll find pages that will take you to photos of all my Bricklin and Studebaker products: 1/48 scale '64 Studebaker Daytonas, Bricklin air cleaner labels, 'My other car is a Bricklin' bumperstickers, 1/48 scale Bricklin models called `Baby Bricks,' and my retired lines: (1/25 scale Bricklin models in my 1st series and 2nd series). I offer my model Bricklins in each of the original `safety colors' as produced by General Vehicle, Inc. back in 1974 and 1975, or I can create a custom model Bricklin to match your car! 1/25 scale for my 2nd series model Bricklins - those are the models with the opening hood and doors - they're a little bit more than seven inches long - 1/25 scale is one of the most popular scales in car modeling. The `Baby Bricks' and the '64 Studebakers are approximately 1/48 scale. Being as they are a caricature more than a scale model, an exact scale is hard to define! The Baby Bricks are about three and a half inches long. The Studebakers are about four inches long. I made the original out of bass wood back in 1982. I spent hundreds of hours looking at pictures and getting each curve and line just right (or as close to it as my eyes could discern). When I finished it originally, I painted it red - not Bricklin safety red - more of a fire engine red. That's the way it remained until the winter of 2001/2002. That's when I decided to start making copies of it. I chose to first revise a major inaccuracy on it that had bugged me for years. The headlight doors were too big and too far up into the body of the car to accurately reflect an actual Bricklin. So I filled in the lines that represented the hood and headlight doors, and recut them. Having done this, I obviously needed to repaint it. Today it's a respectable Bricklin safety white! Upper left shows all the component pieces that go into one of my 2nd series model Bricklin chassis since the redesign. Below that is an up close look at the pieces that go into the engine bay, including a separate engine block, separate aircleaner, windshield washer reservoir and master cylinder. And now I even give my models spark plug wires! The other two photos are there to give you a feel for how my new chassis look when fully assembled. Each 2nd Series Model Bricklin takes over thirty hours to complete! I have designed 17 separate pieces to make a model Bricklin and each must be cast and painted by hand. Doors must be fitted. Headlight doors, too. Four magnets are mounted inside the model - one to hold up each door and each headlight door. Windows must be glued into place. For tires and wheels, I use real rubber tires on nice chrome rims that faithfully mimic the original Bricklin turbines. You'll find a nice chrome `BRICKLIN' plate at the back of the car over the taillight, and elongated `B' logos on the front fenders and hood extension - just like the real thing. 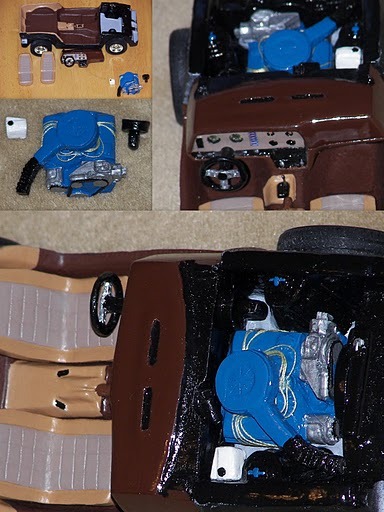 Inside, I've fully detailed the dashboard, you'll see gas pedal and brake, even a gear shift!